I first attended the New Orleans Jazz and Heritage Festival in 1996, and since then, have not missed one. Year 2018 will make 23 in a row for me. And I don't plan to miss one anytime soon. For my first two decades of attendance, I traveled from out of state to attend. In 2017, I made the move to New Orleans, and now live about a mile from the festival. 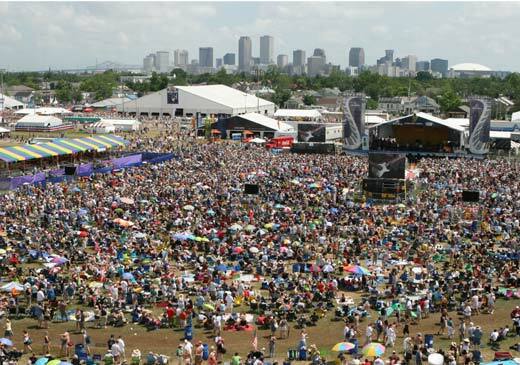 For lovers of all kinds of music, great food, and partying New Orleans style, Jazzfest is the must attend event of the year. As worthwhile as it is, however, planning your trip and figuring out how to get the most from Jazzfest can be complicated. There's lots of information that the official web site doesn't answer, so I put together these pages to help you, my fellow music lovers, join the party. I've also included some tips I've discovered through my experiences, and a few personal opinions as well. Everything here was learned through my experiences as a festivalgoer, or culled from other pages on the web. If you want hints on how to have the best possible time at the world's greatest music festival, read on..